Many travellers are focussed on visiting cities and towns; but visiting wild places is also an important part of travelling. An important part of visiting wild places is ensuring that you know exactly where you are, so that you can get to where you want to go, and are able to get back afterwards. While paper maps are pretty useful for this, the modern method is to use a navigation app on a mobile device. 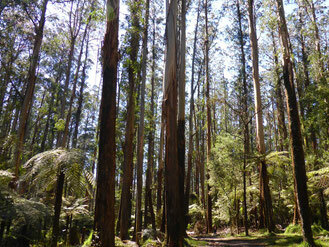 So just what can a navigation app do, and what’s a good app for bushwalking navigation? One of the most common apps used for finding your way around is Google Maps, but Google Maps isn’t the best option for when you’re out of the towns and the cities and into the wilder places. I like to mix a bit of bushwalking (the Australian term for hiking, walking, trekking…) in with my travelling – it’s a fundamental aspect of exploring a place that shouldn’t be left out. While navigation apps like Google Maps will usually do a functional job of telling me where I am even when I get off the well-beaten track, a more specialised app works much better for me. One such specialised app is Handy GPS. 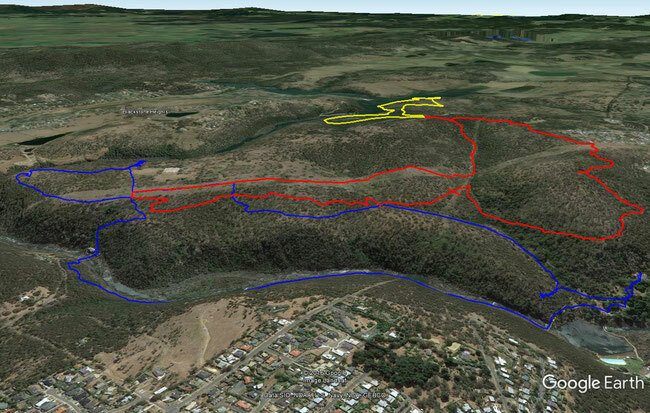 While handy GPS is aimed at “hard-core” bushwalkers, it’s easy for anyone to use it to find their way around in the wild. 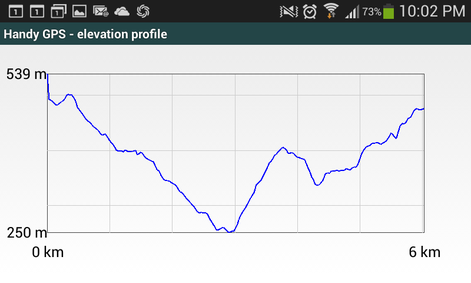 I’ve been using Handy GPS for a few months now, and I find it works well and is very useful. Handy GPS uses your device’s GPS (satellite-based global positioning system) to shows you, on a map, exactly where you are. By itself, that’s no gain over the likes of Google Maps – but Handy GPS also tells you how far you have gone since you started, and it keeps track of where you have been by continuously recording your location and showing a path of your journey on the map. 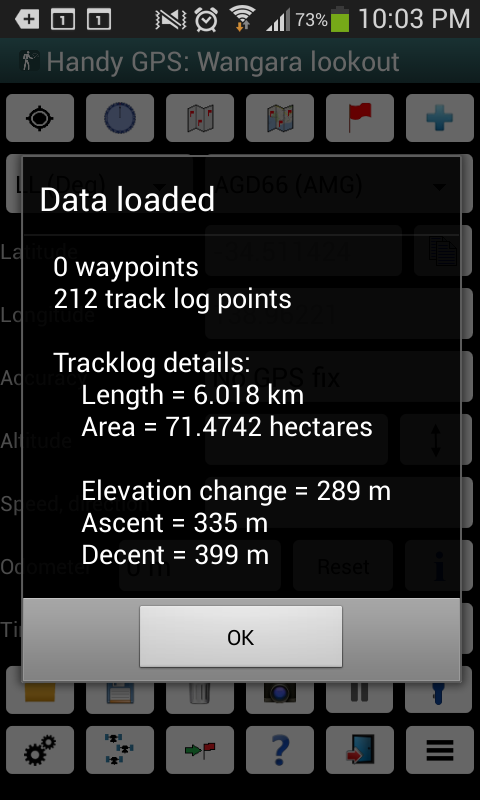 Your position is determined in three dimensions, so Handy GPS also tells your altitude. 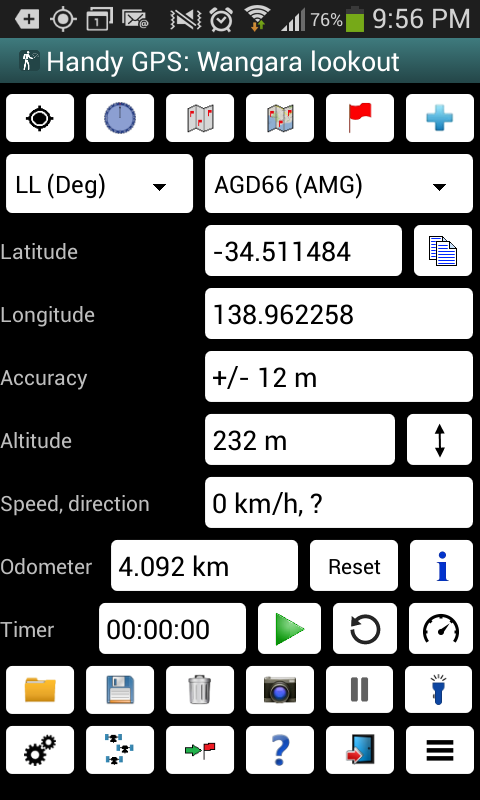 Handy GPS also tells you how fast you are moving and in what direction, and it provides you with a compass if your device has a magnetic field detector, as my low-end Samsung Galaxy phone does. Handy GPS can also show your walking path as an elevation profile, which shows how you have ascended and descended the hills as you go. This is a great way to keep a record of your expeditions. 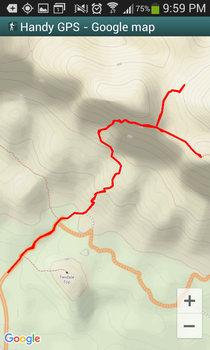 While the map used in Handy GPS can come from Google Maps, Handy GPS also gives you access to more specialised bushwalking or mountain-biking maps that have more tracks (trails, paths) and better accuracy for the things that matter to bushwalkers. Handy GPS isn’t just for bushwalking; it’s also great for a range of outdoor activities such as mountain biking, horse riding, kayaking, and sailing. It’s actually pretty handy in the city, too, as it tells you where you’ve already been, and if you’ve really walked far enough to feel so tired already. Handy GPS comes as a free, limited-feature trial version that will still show you where you are on a Google Map only, tell you how far you have gone, your altitude, and how fast you are going, or as a full-featured paid version with all of the features that I have described above. Like most mobile apps, the full-feature version costs only a few dollars. It’s well worth it for the convenience it gives when you’re off the road. You can find out more about Handy GPS on its website, here.